What!!!!! Which newspaper. There has to be a limit to gossip and speculate. Nonsense. What's that supposed to mean?!!!! I would have thought it was pretty obvious... but if you're still puzzled, go and have a look at Masand's bilious review of Chennai Express whose link I refuse to provide! Your word "bilious" about the review is so apt. That goes for Anupama Chopra as well. What gets my goat is that both of these reviewers LOVE to have SRK on their shows which boosts ratings and gets them a big audience, but neither will admit that the same appeal that they love to tap into makes a great film too. #SayHELLOToShahrukh @iamsrk definitely has the best fan clubs and some seriously loyal fans. A big shout out to all you amazing people! ^ that one's not really about SRK, to be fair. 200 Crore Club #Award goes to @chennaiexp2013, @krrish3themovie and @dhoom3themovie. RT if you have seen all the three. That's cuz this film is releasing this weekend! We entertainers don't usually have books to learn from... or schools to go to. There are no crash-courses. We primarily learn "on-the-job". We observe. We read. We are inspired. We form our own path taking in experiences from everything and everyone we encounter. That's really how we grow. Each event is a practical exam. Each show is an appraisal. Now.. I've had a teacher who has taught me how to entertain. How to be both, an entertainer and a good human being, at the same time. I've never met him. Over the last 15 years, I've read his words, heard him speak, devoured his interviews, watched him go about his madness all over the world.. and imbibed his unbridled passion for Entertainment. He has been the single largest influence on my career as an Entertainer. Be it singing.. performing.. MC'ing.. acting on stage or on screen.. doing voice-overs in a studio.. he's always been an influence! He's not merely an actor or a superstar. He's a a true showman. An orator par excellence. A philosopher. A dreamer. A guru of everything in the universe and beyond. His mischievous innocence, his rock-solid experience, his humble demeanour, his courage to dream, his intense love for the audience... have been some of the most important chapters in my text book. I hoped to meet him one day. I didn't know I'd get to announce his name the way I did last evening. I didn't expect to share stage with him for "two whole hours" at a prestigious corporate event I was hosting. I told him on stage, "I've waited 15 years to shake your hand"... and he hugged me. Standing in his presence and hearing him speak was an experience that's changed my life. Like I mentioned yesterday... I must have done something good to deserve this! Thank you Sandeep Sinha Gautam Nalini Rao K M Nanda Kumar Bhaskar Reddy Pranab Nayak and your team for putting me up on that stage. I wish I could explain to you how much this meant to me. I'm sure you already know. He has been my greatest long-distance education. The teacher I never met.. until last night. I waited 15 years to do this. Last night.. 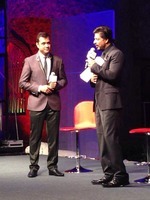 I shared the stage with Shah Rukh Khan. What a beautiful thank you to SRK! Thank you so much for posting it! Wow - is it #14YearsOfPBDHH? 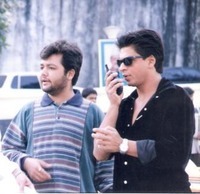 I had joined @iamsrk's company when it was being made. Fun times. And the coolest boss ever. Your fly lost touch with relatives here,they disapproved ur mon's wedding:) "@iamsrk: In Hyderabad.Good to be here where my mom hails from." From Toli Chowki, recollect you mentioning to me! "@iamsrk: In Hyderabad for an evening. Good to be here where my mom hails from." That's what I meant that he was sending a beautiful thank you to Shah Rukh.....it was so heart felt, lovely words. @shailja Is SRK attending Filmfare? @srkianz Unfortunately he is not.